Length of Inkwell: 20,9 cm. Length of Pen: 14,5 cm. Soft-touch grip for maximum comfort without compromising on style. 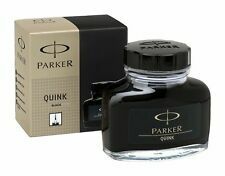 The enduring stainless steel finish gives the pen a typical Parker feel of quality. We also deal with wide range of printing and stationary products. 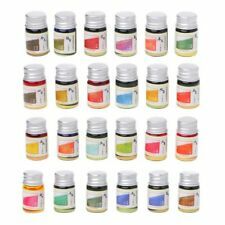 1Pc x Colored Bottled Fountain Pen Ink. Material: Colored Ink. Our paint will glow brighter than any other similar product ,giving off a trippy effect that will stay illuminated. Color:As the picture shows. ANTIQUE INKWELL. Condition is Used. The color of the actual products may be slightly different from that of the images on this web site. Origin: Made in Japan. The case is covered in shagreen with a faux tortoiseshell top. This is for a superb antique traveling inkwell. Qalamdan Case. Ink Well & Quill Holder. Islamic Persian. Solid Brass. Good condition. Length approx. Reproduction antique cobalt blue glass inkwell. Charming small size on this piece making for a attractive display. Very heavy thick glass each with charming subtle signs of being hand made. Souvenir from 1908 Edinburgh National Exhibition. Pen & ink box in miniature suitcase. The pen in ingeniously in the shape of a rolled up umbrella with an ivorine handle which fits into the handle of the suitcase. Base/body seems to be made of cast iron and decorated with brass, the removable ink reservoir does seem to be made of brass. (9" long and 4 1/2" wide at the widest point). Quite heavy. Antique carved pen and ink stand. - Hand carved design. 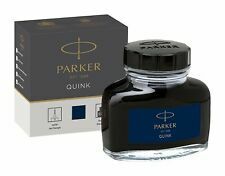 - Space for 2 ink well 2 in square. Notice all the small places for trinkets. Certain to be a great addition to any period decor. 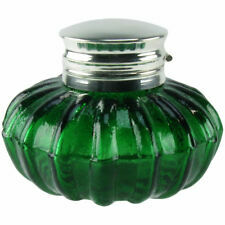 This is for a stylish art deco desktop inkwell and pen stand from the early 1900s. The inkwell has a hinged lid and a ceramic liner inside and the boat sails can be angled differently as can the base of the boat. You will get what you see ! Display or for use etc. This is a very detailed piece and a complete piece as well. The inkwells are removable and are acorn type inkwells. They are sturdy and work. One has been used more than the other (see photos). The only thing this piece really needs is a nice detailed cleaning. 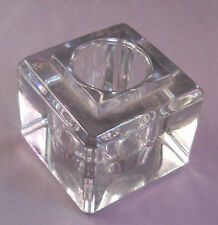 Clear Cut Glass Inkwell Antique Reproduction is an antique reproduction clear glass inkwell with silver top. Glass ink well is representative of antique inkwells used throughout history, featuring a beautiful clear cut glass design, with a silver hinged pop off top. In Antique As Found Condition. Gorgeous Antique Chinese Cloisonne ink well set and bamboo Brush 19th century. Antique Chinese Cloisonné Dual Inkwell Set. Museum Quality piece circa 1820. Great for any collector. Unusual colors and pattern. Great colors and detail. Wear Consistent with Age and use. Fee for this service dependent on size and if i need to bring help. Owl's head with glass eyes hinged to reveal a little removable glass inkwell. A very tactile, rare and highly collectable piece of 19th century Irish history. The round stand carved with Irish Shamrocks. ANTIQUE FRENCH BRONZE INKWELL,SIGNED,ART NOUVEAU. ORIGINAL GLASS INKWELL. IT S IN VERY GOOD CONDITION,WITHOUT CRACK OR DENT,WE MUST JUST TO NOTE,WEAR ON THE GILDING. SIGNED: S HUYGENS. A very nice brass double inkwell with a letter holder and pen holder. Beautiful old glass inkwell with brass porthole hinged opening. Six sided (hexagonal shape) and in great condition from another era. MAGNIFICENT OTHERWISE & FREE OF REPAIRS OR OTHER ISSUES. PICS & KINDLY LOOK CLOSER AT OUR OVERSIZED IMAGES. We specialize in all things Deco, Nouveau, Roaring Twenties & Jazz Age. THIS PIECE IS QUITE LARGE & HEAVY. Art Nouveau glass and sterling silver inkwell. Made by Gorham in Providence. Rectilinear clear glass block bulbous well. Engraved interlaced script monogram and interlaced scrolls, flowers, and leaves. 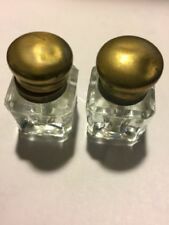 Great reproduction of an antique wood double inkwell desk set. Made from a beautiful unknown hardwood. This piece accommodates the two included porcelain inkwells under a nice hinged top. Notice the carved bed towards the front of the piece to display a nice period pen. Double fond inkwell, 2/1701 inscribed on the back of the satyr stand. satyr stand surrounded with grapes. Napoleon III bronze gilt Inkwell. Make sure that you decide good to acquire this item. Condition: misses the glass inserts. VERY NICE BIRMINGHAM 1945 SOLID SILVER SEGMENTED INKWELL.LOVELY PIECE. (There can be no complaints this way,so its up to you. is not our policy to do so). Rare Chinese Export Porcelain Inkwell w/Bird Quill Holders, c. 1780’s. 2” sq. Hand Painted Floral Design. 2” square and 2 ½” tall. Lovely ANTIQUE English Sterling Silver Inkwell Set. Item is OVER 160 years old, from the LETTER DATE marking it show to be dated. This could hurt your buying ability in the future. : This item is an Estate sale find, do not expect mint-condition. C1907 Lovely ANTIQUE Charles & George ASPREY. Silver & Crystal Inkwell with Stand.